Happy Thanksgiving, Rotobahn Fam, and welcome to the Week 12 Quarterback Rankings.! My emphasis with the early rankings will be the Thursday games. I’ll be doing some of my typical Wednesday research on Friday and that will probably cause more adjustments than usual when I do the Saturday update. Just a little FYI there. I was able to get the these QB rankings about where I want them, but I am running low on time to do write-ups for the other positions, so the rankings will be up, but they should be light on Skinnys. I can’t burn the midnight oil tonight as Jimmy Hackett and I are doing the 3 hour lead-in show on WEEI tomorrow. Check it out! 1 Andrew Luck IND 6.400 MIA@IND 11/25/2018 04:25PM ET He is, as they say, rolling. No reason to shy away here—at home versus a beatable defense. Ryan Tannehill playing is a mild bonus as he should help the Miami offense stay more competitive compared to Osweiler. 2 Cam Newton CAR 6.200 SEA@CAR 11/25/2018 01:00PM ET Solid home matchup. Plenty of big game upside. 3 Aaron Rodgers GB 5.800 GB@MIN 11/25/2018 08:20PM ET Another tough road matchup for Rodgers, but after some of throws he made last week, I’m still buying. They won’t be run-heavy in this matchup. Too bad he’s off the main slate. 4 Jameis Winston TB 6.000 SF@TB 11/25/2018 01:00PM ET Pass volume plus a sweet matchup and you have to like Jameis thsi week—as long as you can stomach the risks. Let’s be honest. This team has yanked its starter three times this season. 5 Ben Roethlisberger PIT 6.100 PIT@DEN 11/25/2018 04:25PM ET A beatable road matchup, but Big Ben’s always an adventure on the road. He bailed us out at the end in Week 11. Will we be so lucky here? I’m unsure. 6 Kirk Cousins MIN 5.500 GB@MIN 11/25/2018 08:20PM ET Solid home matchup and a big game, but he’s off the main slate. 7 Tom Brady NE 6.500 NE@NYJ 11/25/2018 01:00PM ET It’s a road game but the Jets are a get-well matchup for Brady and company. They don’t rush the passer well and they have exploitable holes on the back end. Edelman should have a big game. He’s stackable. 8 Deshaun Watson HOU 6.000 TEN@HOU 11/26/2018 08:15PM ET You need to throw to beat the Titans so I think Watson has some ceiling here. His rushing yards come on broken plays so the foot-point factor is still in play. 9 Lamar Jackson BAL 5.700 OAK@BAL 11/25/2018 01:00PM ET He posted 19+ points on DK last week without making the big play or scoring a TD via run or pass. The potential for a monster game is obviously there and Oakland could be the team that allows it. There’s also bust potential if he flames out and his weak fundamentals (in some areas) could allow for that. I think his wheels give him a 15 point floor. He’s a guy to use in GPPs. In seasonal leagues, you have consider the risks. There are players ranked behind him with better floors and less injury risk. 10 Russell Wilson SEA 5.600 SEA@CAR 11/25/2018 01:00PM ET Plenty of reasons why he’s not elite for FF, but he’s playing at too high a level to not be a QB1. His efficiency has been unreal. Carolina’s pass rush is less than what he’s faced in recent weeks. The issue with this game is pace. Both teams play slow. Wilson’s run volume is more volatile than Cam’s, which is why I have Cam higher. 11 Carson Wentz PHI 5.900 NYG@PHI 11/25/2018 01:00PM ET I think he bounces back here—at home in a much better matchup. 12 Philip Rivers LAC 5.800 ARI@LAC 11/25/2018 04:05PM ET Solid matchup here as he has enough weapons to target Arizona’s weak points. 13 Baker Mayfield CLE 5.500 CLE@CIN 11/25/2018 01:00PM ET Pass volume could be an issue (Chubb is the focal point now) but the matchup is very good. 14 Eli Manning NYG 5.700 NYG@PHI 11/25/2018 01:00PM ET He thrived last week but it was at home versus a team without much of a pass rush. This will be more challenging. 15 Andy Dalton CIN 5.300 CLE@CIN 11/25/2018 01:00PM ET If Green is practicing fully by Friday, I will upgrade Dalton. 16 Case Keenum DEN 4.700 PIT@DEN 11/25/2018 04:25PM ET Showed enough last week to be better than than all the dreck ranked behind him. Still, hopefully you have better. 17 Nick Mullens SF 5.400 SF@TB 11/25/2018 01:00PM ET He’s viable in a matchup this good, but gets a slight bump down with both Garcon and Goodwin out of the lineup. 18 Marcus Mariota TEN 5.300 TEN@HOU 11/26/2018 08:15PM ET Should start but we are back to wondering how healthy he is so…. ***UPDATE*** Full practice so good to go. 19 Ryan Tannehill MIA 5.000 MIA@IND 11/25/2018 04:25PM ET No way you want to play him. The best you can say about him is that he’s not the worst. 20 Blake Bortles JAX 4.900 JAX@BUF 11/25/2018 01:00PM ET Thsi projects to be about as ugly a game as you can have. 21 Josh Rosen ARI 4.500 ARI@LAC 11/25/2018 04:05PM ET Tough matchup, so he’s not a good idea. 22 Derek Carr OAK 4.600 OAK@BAL 11/25/2018 01:00PM ET No way. 23 Josh Allen BUF 4.400 JAX@BUF 11/25/2018 01:00PM ET I’d rather eat flaming hog balls than start Josh Allen this week. 24 Josh McCown NYJ 4.300 NE@NYJ 11/25/2018 01:00PM ET He’ll start for the Jets this week in a tough matchup. He’s viable in 2QB leagues, but the Jets lack weapons. 25 Brock Osweiler MIA 4.500 MIA@IND 11/25/2018 04:25PM ET Should go back to the bench this week. 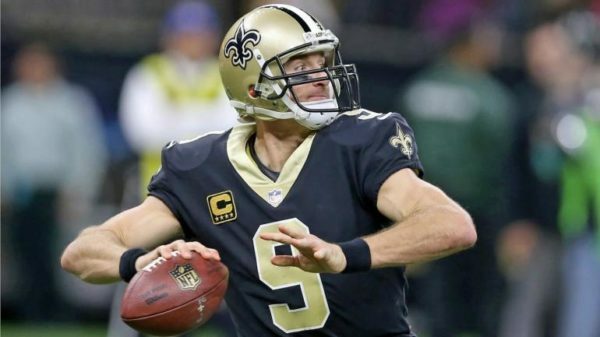 26 Drew Brees NO 6.700 ATL@NO 11/22/2018 08:20PM ET (ALREADY PLAYED) He should easily be the most-owned QB on the holiday slate and for good reason. If you can find a way to a unique lineup with Brees at the top, then you certainly have a good shot at banking if your unique pieces hit. 27 Matt Ryan ATL 6.100 ATL@NO 11/22/2018 08:20PM ET (ALREADY PLAYED) He’ll be the 2nd most owned QB on the Turkey Day slate by my estimation. You have to like the matchup for him. The Falcons are still in the playoff hunt with a win, so they will have some fight in them. They really can’t go ground heavy as they lack the personnel and because the Saints stuff the run. The odds of the Falcons being throw heavy seem very good. Ryan will be at the core of most of my T-Giving day lineups. 28 Dak Prescott DAL 5.100 WAS@DAL 11/22/2018 04:30PM ET (ALREADY PLAYED) Tough matchup for Dak but their style of play helps him since they will use his wheels at any time—including near the stripe. More near the stripe, actually. He’s playable, but the ceiling is mediocre unless he really runs a lot. 29 Matthew Stafford DET 5.300 CHI@DET 11/22/2018 12:30PM ET (ALREADY PLAYED) He’s a tough guy who can throw it all over the field, but he lacks the kind of weapons he’s grown accustomed to. It’s also a tough defense he’s facing. If Chase Daniel really struggles, it could help some—with more time of possession and with a meager ground attack (Kerryon Johnson will not play), he could end up pass heavy. 30 Chase Daniel CHI 4.400 CHI@DET 11/22/2018 12:30PM ET (ALREADY PLAYED) Will start for Trubisky barring a miraculous turnaround. Daniel is a veteran who has command of the offense, but he’s largely untested with only 78 pass attempts over 8+ seasons. I think this offense gives him a chance to succeed, but this is a game where the pace will be slow so it’s hard to see him as anything other than a contrarian flier in DFS or am emergency starter in in seasonal leagues. 31 Colt McCoy WAS 4.700 WAS@DAL 11/22/2018 04:30PM ET (ALREADY PLAYED) I like Colt McCoy as a player. He’s got Moxie and guts in large amounts, but he’s in a tough spot here—playing behind a battered OL without three (Richardson, Thompson and Crowder) of the team’s primary playmakers. He’s for desperate situations. I’m not using in as a contrarian option on the T-Giving slate. Chase Daniel is much better suited for that type of use. 32 Mitchell Trubisky CHI 5.900 CHI@DET 11/22/2018 12:30PM ET (ALREADY PLAYED) Doubtful with a shoulder injury. He’s essentially out. 33 Sam Darnold NYJ 4.500 NE@NYJ 11/25/2018 01:00PM ET May sit again, but not a good play if he goes. An at-times confused rookie against a Belichick D and the Pats in a need-to-win situation (to keep pace)? Nope. None for me, thanks. ***UPDATE*** He’s out again. 34 Joe Flacco BAL 5.600 OAK@BAL 11/25/2018 01:00PM ET Could play this week but Jackson will most likely get another start. ***UPDATE*** He’s out.